באפשרותך לחפש או ליצור את התבנית הנכונה, שתחסוך לך הזנה חוזרת ונשנית של פרטים בסיסיים של תוכן ופריסה. בנוסף, כיוון ש- Word שומר את השינויים במסמך החדש ולא בתבנית, תוכל להשתמש באותה תבנית במסמכים אחרים ללא הגבלה. Word displays available templates when it first starts. You can also view and choose templates by clicking New from Template on the File menu. 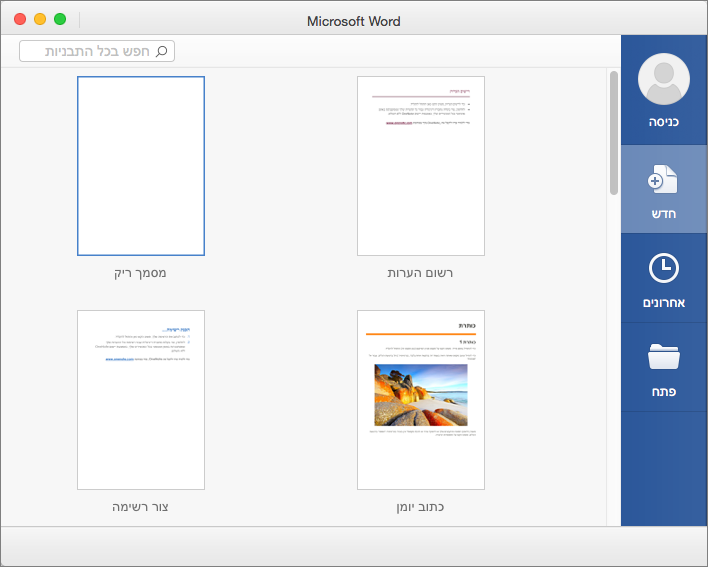 עצה: Double-click Blank document to start with a blank page. You can search for more templates by typing keywords where you see Search All Templates, in the top right corner of the window. When you find a template that you like, double-click it to create a document based on that template. עצה: If you frequently open certain documents, change parts that are outdated, and then save the document with a new name, consider saving the document as a template. That way, you have a single master document to work from. For help, see Create and use your own template in Office for Mac.